The raviolo al uovo is one of the dishes you'll find on Ruins' Restaurant Week menu. 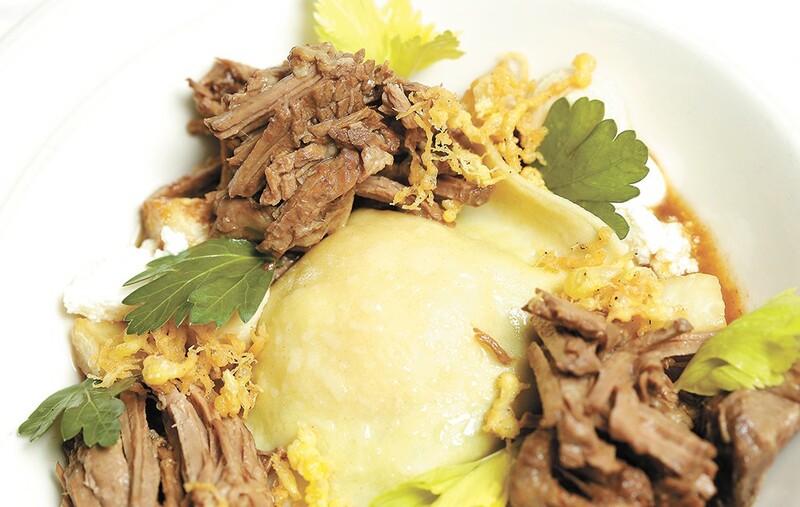 As drudgery of winter rolls on, food lovers (which should be all of us) can find some brightness on the horizon with the knowledge that Inlander Restaurant Week (Feb. 23 to March 4) is only a few weeks away. And before that tasty stretch of days arrives, you can get an early Restaurant Week fix. New to the five-year-old Restaurant Week this year is the First Bite event on Thursday, Feb. 2 at Barrister Winery, which brings some of the participating restaurants together to give you samplings of what they'll be serving later in the month. The limited event (there are only 180 tickets available, at $29 apiece) also includes two glasses of wine from Barrister and a chance to sample artisanal cheeses from four different producers, in addition to the samples from five restaurants. The restaurants on hand with items from their Restaurant Week menus are Ruins, 1898 Public House, Dockside, Wandering Table and Uva Italian. First Bite also serves as the unveiling of the 106 Inlander Restaurant Week menus, which go live online the same day. You can also visit with industry professionals and mingle with your fellow, dare we say, "foodies," while taking in some acoustic tunes.